Sometimes people will remark that I have a fish on my foot, as if I didn't know. This is so true! I have a tattoo on my foot, and whenever I wear sandals, people who see it tell me I've got a tattoo there. Thanks, Captain Obvious. Now who's the stupid one? I cant even count how many times I've heard "OMG! You've got a tattoo on your foot!!!" I like reviving these old thread topics. When I get back from my trip I'm going to search around in Toytown's dusty thread vault to dig up some more old thread topics that I think are interesting. Btw, I'm such a wimp when it comes to needles I could never get a tattoo. I'm a wimp, actually, too. I still cringe away and hyperventilate when I've got to get a blood test or routine immunization. Maybe somewhere in the back of my mind, tattoos don't make me as nervous because they're more like scratching than anything else? Me too. In fact, I'm a blood drawer and nurse worse nightmare when it comes to giving blood or getting an injection. I'm afraid of needles! I have a very bad case of needleaphobia. I knew a beautiful mid-west blonde at college named Susan. Seriously, she was beautiful literally from head to toe...meaning even her feet were cute. But, not the brightest bulb. She got the idea to get a black widow tattooed around one of her toes. The artist did a good job, I'd thought. "See the red symbol in the middle of the spider?" "Yeah. It's a Black Widow. They all have that." "Well...it's not on their backs like the tattoo makes it look like. It's actually on their bellies." "So your tattoo makes it look like the spider got crushed in between your toes and died belly up." Needless to say, Susan was pissed. The moral of this story is, if you're going to get something permanent on your body, know WTH you're putting there. I soo agree. And there's something else one should take into consideration: what will the tattoo look like when you're in your 40s and gained 20 kilos? And what will it look like another 2 decades later when the skin goes all limp and wrinkled? Okay well why not simply black out the red bit? Problem solved. because then nobody would know it's a black widow. It'd just look like any other black and slightly hairy spider. @Huggle, re: "The poor nurses in the retirement homes who'll have to see all those shrivelled "Arschgeweihe" in 40 years... " : Offer them a change of scenery? I did think about that when I got my first, though. The second is something of a work in progress: When I have money, I'll get it. As a response to the original q: No, people who get tattoos aren't automatically stupid. People who get tattoos without first thinking hard about them, considering the consequences, and looking into the health and safety controls of their parlour of choice? Well... I'll try not to be too judgmental and assume they weren't thinking clearly. All of that can be said for people who get piercings, though. As an example: I think that the vast majority of people with facial piercings don't consider the potential impact on their jaws and teeth, or the consequences of an infected eyebrow piercing. Correct me if I'm wrong, though. When I was a very rebellious 14 year old, I thought it would rock to get a dragon tattooed on my stomach. It was to start on the bottom part of my breast and then carry on down my then-slim stomach, with the tail pointing to my crotch. Oh yeah. So cool. And edgy! Riiiight. And the brilliant artist who was to place this on my body was a prison tat expert using a homemade tat gun, so that will give you an idea of the quality. After drinking several shots of Jim Beam to get my courage up, He began inking me and I thank God everyday that I have a VERY low pain tolerance and screamed like a little baby. So I ended up with just a little teardrop shape. WTF gets into teenager's heads sometime? That said, I have been thinking for years of getting a tat. Not sure how I can get around my very high wuss factor, but I would like something smallish and artistic that is related to my son, perhaps some stylized version of his initials. I've got just 1 tattoo. It was not well planned (I was chatting with the tattooist the night before, having drunk lots of cactus juice) nor great quality, but I still love it 6 years on. It was done in Cuzco, it's of a Nazca humming bird and is a reminder of the end point of a lovely year traveling. I plan to get another one soon - probably the kids names, definately better quality. 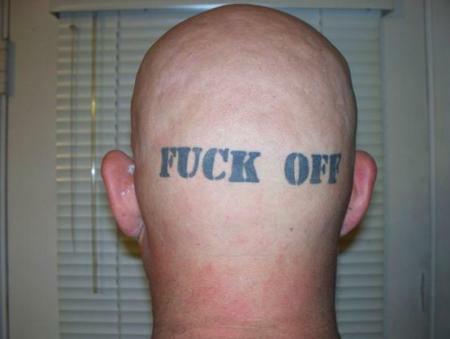 I'd never judge someone stupid for getting a tat, but the people here - Stupid Tats - well, some of them must be. And is it just me, or is this one crooked? Just the right thing to get a girl in the mood? Don't get me wrong, this is a very valid point. I'd be ignorant if I thought otherwise. It was discussed earlier in this thread, though, how so many people have tattoos. This means that there are probably going to be a lot of old people with saggy tattoos in nursing homes in a couple decades. So, it doesn't make me too worried. 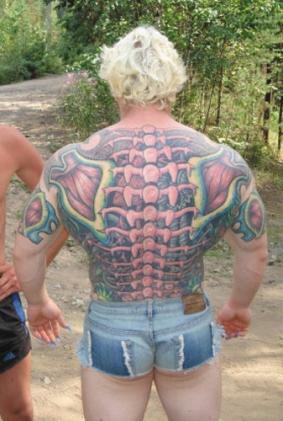 Plus, a lot of err.. some people do pay attention to where they are getting their tattoos. Like llees and I both said, it's possible to make sure the tattoo can be covered and be placed in a non-saggy area. My step-mom's brother is about 65 and covered in tattoos. They don't look bad. Yes, they're a little faded and his skin is a little loose, but I've seen fresh tattoos that look worse. 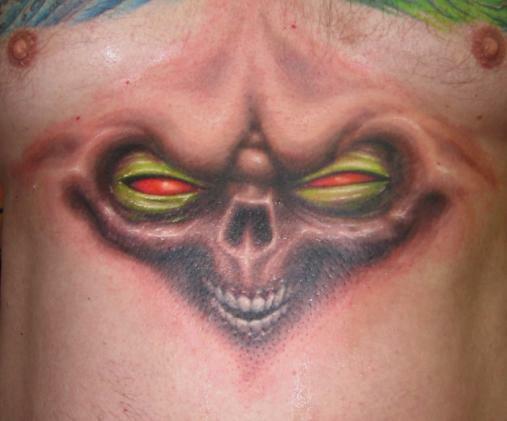 It pays to have a good tattoo artist and to get things done well and in the less stretchable places. 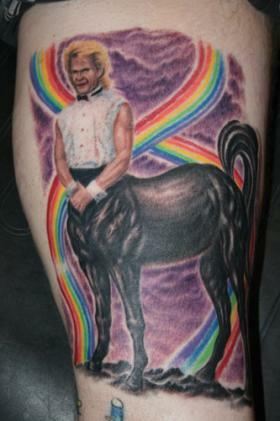 I've always loved the Swayze unicorn. The guy who did my last one had taken a few courses in human anatomy, specifically musculature, because he specialises in freehand and wanted to be able to take the movement of the muscles into account when thinking about the placement of the tattoo, so it moves when I move. I recommended the guy to a friend of mine, who got a tattoo of a ninja just under his armpit (he's a mixed martial arts guy; it wasn't the ninjas-vs-pirates crap). The ninja moves his sword when the guy lifts weights. Also, one of mine's in green ink that will fade into the colour of oxidised copper. It's also possible to take fading into account. It's all about being sensible, researching properly and not settling for some drunken fool with a homemade tattoo gun and a box of antibac wipes. I have to say that in this day and age I am quite shocked at the narrow-mindedness of a lot or the responses as to whether people with tattoos are stupid or not. Do you ever think that it might actually be just about doing something because the individual likes body art..? Why does it have to be a case of no imagination (Chocky?) and why should people be classed as stupid, easy (if you are of the female persuasion..), or a lout? Have we forgotten that people have been 'marking' their bodies for many years, in many different cultures, and for many different reasons. Just because you don't understand what makes somebody want to do this, or just because you wouldn't, shouldn't mean that those who chose to should be berated or made to feel like some kind of social outcast. We all have our own ideas as to what we like, or don't. Dress, hair, shoes, music etc etc. Granted a tattoo is more permanent, and should not be entered into lightly, but other than that, what does it have to do with anybody other than the person whose body it might appear on? It's not quite in the same league as a smoker for example, who effectively passes on a disgusting smell, not to mention potential health risks to others, is it..!?? I am the 'proud' owner of 4 tattoos and a belly button ring and in the 14 years of having them, I do not believe they have ever been responsible for causing harm to anyone! Oh, and just to give you some info on me,before you start pre-supposing you know who or what I am! I am a 38 year old Senior Manager of a technical company, so I think it's safe to say I am neither stupid, nor a lout (nor easy of virtue either, might I add!) Perhaps the fact I chose to locate them in less 'in your face' locations, means I might just scrape above the level of stupid... in your eyes! This is my body and what I choose to do with it, is up to me. If we all walked, talked, dressed and behaved the same way, life would be extremely dull! Enjoy the rest of the Sunday and try to open you minds a little more...you may be quite surprised at what life has to offer outside of the box. ps. Have you ever thought that perhaps you should thank people with tattoos, for adding a little bit more colour to the street you are walking on! I took the kids to the public pool for a swim today, and the second thought that entered my mind after "and they say americans are obese?" was "when did everyone join the circus?" The combination made a lot of the tatoos look as though they were animated (one woman had some kind of animal head coming off her bikini line that looked like a back dashboard bobblehead doll). My kids asked me why everyone was trying to look like prison gang members or outlaw bikers. If it's really about showing off one's unique personality via "body art', why does one seldom see a landscape, or the Mona Lisa or something artistic instead of the same old unicorns & rainbows, grim reaper/sculls, crosses, snakes, panthers and rock band imagery everyone seems to (clearly drunkenly) choose out of the same catalog the way chinese people choose the decor for take-out restaurants? My personal theory is that tatoos are chosen either consciously or subconciously to piss people off; the dumb fashions and haircuts of adolescence are easily reversable, but as the old saying goes, nothing's truly fun unless it makes your mother cry. A coworker on a summer job had gotten drunk whilst in the navy and had the Zig Zag rolling paper guy smoking a joint tatooed on his forearm. All he used to talk about was how he was trying to sock away enough dough to have it removed once he had a kid; he said he dreaded the day he had to explain to the kid why he shouldn't smoke pot, but that dad liked it so much he literally scarred himself for life. Dangerous epidurals aside, how does a mother of a pre-teen girl explain what her motivation was to have a Panama City License Plate scrawled across her lower back ("mommy liked to look extra slutty for Spring Break!")? Or to one's family that one's spiderweb neck tatoo might have something to do with why the family remains stuck in a trailer? More recently, the daughter of a female acquaintance could not wear the wedding dress her mother had loving saved for her because she'd gone out and had a strand of barbed wire tatooed on her upper arm. I attended a conference recently, where I chatted with a female attendee who came across as knowledgeable and well turned-out. She took the stage and one couldn't help notice that she had a massive lower leg tatoo visible under her stockings. My first visceral reaction was that I suddenly had a lower opinion of her and questioned her judgement. Maybe it's my age. Or military instances where one often saw tatoos scuttling potential promotions out of enlisted ranks because "it went to character". But from that moment forward, she was "the one with the tatoo"; since potential employers have to use weed-out criteria to sort through piles of resumes, this is literally a self-inflicted wound. Maybe some of it is okay. A college clasemate was a wrestler who's had his prep school mascot tatooed onto his upper thigh that was only visible when he wore a wrestling uniform. Phil Knight of Nike lost a bet and tatooed the Nike swoosh on his left ankle. 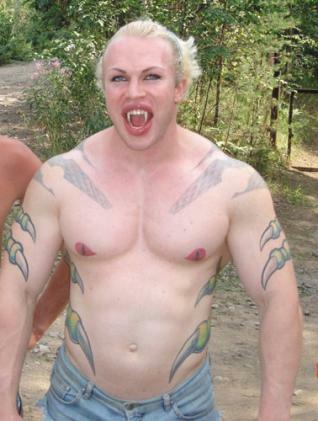 The good news for my kids is that today's adults are making tatoos and piercings so common and unappealing that their propensity to mess with their physical appearance in ways that could negatively impact their path through life is declining by the day. And, in a pinch, they could be still eventually be buried in a jewish cemetary.